Announcing our Newest Residential Recovery Home! 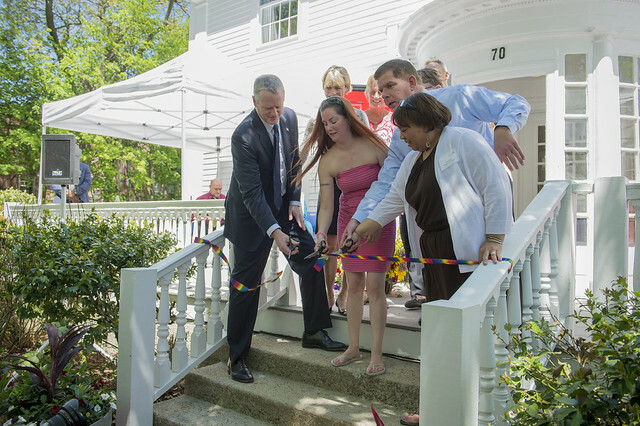 On May 18, 2017, we celebrated the Grand Opening of New Joelyn’s Home, our newly renovated 24-bed, state-of-the-art women’s residential recovery program with luminaries from across the Commonwealth including Massachusetts Governor Charlie Baker and Boston Mayor Marty Walsh. Opening this new facility proves yet again, despite all odds, Victory Programs can make impossible dreams come true with enough perseverance, home and help from you and the many members of our community! New Joelyn’s Home represents the culmination of more than two-and-a-half years of planning, preparation and implementation to rebuild the women’s residential recovery capacity at Victory Programs. Located in the heart of Boston’s Roxbury neighborhood and housed in a beautiful old Victorian home, this program stands as a safe-haven for women who have struggled with substance misuse disorder and need support on their journey to recovery. From the day the only bridge to Boston Harbor’s Long Island closed and we evacuated Joelyn’s Family Home, to the day we open the doors to New Joelyn’s Home in Roxbury, it has been a long journey. We are deeply grateful to everyone who has helped us along the way. Please click here to read recent news coverage of New Joelyn’s Home.